Leonardo da Vinci's reputation needs no introduction. The man was a man of all talents, never shying away from trying something new. 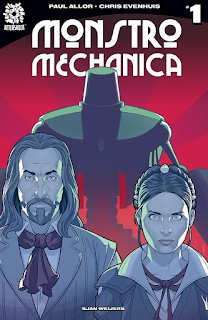 In Monstro Mechanica #1 from After Shock Comix shows da Vinci trying something new and its consequences. The issue is written and lettered by Paul Allor, illustrated by Chris Evenhuis and colored by Sjan Weijers. At the height of the Renaissance, warring factions vie for control of Leonardo da Vinci's destructive arsenal. The only thing standing in their way is Leonardo's young apprentice and her nine-foot tall mechanical bodyguard. Together, they navigate a world of wicked men and war machines, determined to save Leonardo from the world-and the world from Leonardo. Allor realizes that da Vinci was an interesting man living at an interesting time and Monstro Mechanica #1 is a great representation of that. His characterization of Leonardo da Vinci is one that parlays his raw intelligence into something that borders on arrogance. That arrogance may materialize into something that not even da Vinci is equipped to handle, as Allor's inclusion of a robot invention of his seemingly growing sentient taps into more modern worries about AI. What's interesting is how Allor uses da Vinci's personality to bolster Isabel as a character; she's something of an apprentice, but she also realizes that da Vinci might be getting in over his head and is afforded some quality character development as a result. And while the book seems to center around da Vinci, Allor doesn't necessarily make him the focal point as he really plays out more as a player in a much larger game. The artwork by Evenhuis is pretty slick. His linework feels somewhat weightier compared to Weijer's colors, giving each character a stronger presence against the gorgeously rendered backdrops. Evenhuis illustrated da Vinci's golem in a way that's appropriate for the time, emphasizing the relatively simplicity of an entity cobbled together with wood. The rest of Italy is illustrated with an attention to its livelihood as Evenuis focuses on the look and feel of the era. da Vincia in particular feels sufficiently badass, in that Evenhuis seems to have captured the essence of his appearance while at the same time giving him a swagger. Weijers' colors are rich throughout the the issue a well, further embellishing the depiction of the era. Monstro Mechanica #1 is a fun, anachronistic book that takes a well-known individuals in Leonardo da Vinci and gives him a more modern flair. da Vinci and Isabel are working feverishly to achieve da Vinci's machinations, all the while the Pope is seeking to extend his reign. Allor's script is pretty fast-moving and entertaining, emphasizing the knowledge on the part of da Vinci that he's one of a kind. The illustrations by Evenhuis are sharp and crisp, portraying da Vinci and his cohorts in a way that feels accurate. Monstro Mechanica #1 is a fast-paced romp through history that gives readers a new take on an historic figure. Monstro Mechanica #1 is available December 13.